Salisbury, North Carolina Real Estate: Stunning Vintage Circa 1900 Home ~ Immaculately Restored ~ Under $200K! 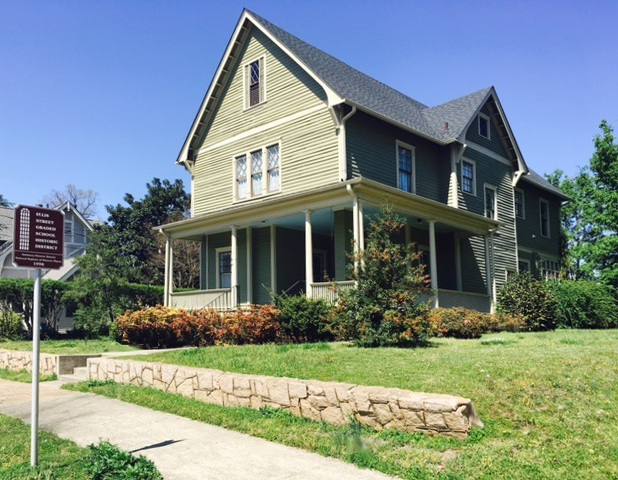 Stunning Vintage Circa 1900 Home ~ Immaculately Restored ~ Under $200K! The queen of West Liberty Street in Salisbury North Carolina: 418 W. Liberty Street. Perched on its elevated lot ~ this fabulous vintage home overlooks the Ellis Graded School Historic District, crowning the neighborhood with its grand presence. And almost too good to be true . . . this immaculately preserved vintage 4 bedroom/2.5 bath, 3199 sf home, is priced UNDER $200,000! This gracious, nearly 3200 square foot home may be a circa 1900 masterpiece, loaded with original details, but 418 West Liberty Street accommodates today's life styles with many wonderful modern amenities and updates. But first, let's take you up the front steps, past the granite block retaining wall, to see what this home that commandeers the entirety of the 400 block of W. Liberty Street is all about! The beauty of this home is stunning! Take it all in: Spacious rooms, formal living & dining rooms, a modernized eat-in kitchen, library, and upstairs laundry. Take a look at the wonderful breakfast room and sun room overlooking the private and secluded patio, then picture yourself watching sunsets from your elegant wrap-around porch that graces the front of the home. Many original details are intact, while modern conveniences, including a second floor laundry, abound! All this for under $200,000! The time is now to make 418 West Liberty Street in Salisbury North Carolina your home! Contact Greg Rapp at 704.213.6846 to schedule your private showing.